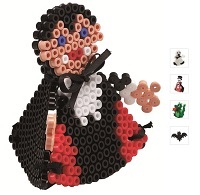 3D Hama Bead Sets for the more inventive sort! Take your Hama skills to a whole new level with amazing 3D Gift Sets! It’s Hama with added inspiration. Create lots of different designs and make them 3D for an extra special look. Each comes with approximately 3000 beads, 1 large peg boards, and satin ribbons. Each themed pack such as 3D Chicken and 3D Spooky comes with easy to follow instructions. Excellent site. Plenty of useful info here. I’m sending it to several buddies ans also sharing in delicious. And certainly, thanks on your effort!